We’ve had a lot of rain recently thanks to some late winter storms that finally dropped some snow in the mountains. But the rain and now rising snow lines has created an excess of water that quickly finds it’s way into the river basins. I took my boys down to Alton Baker Park in Eugene to check out the Willamette River and see how high the water was. It’s pretty incredible to see the amount of water flowing right now. While we were there we bumped into a photographer for the Register Guard who was sporting a sweet 300mm Canon lens and a monopod. I’ve never used a monopod but I can sure see that they would be handy with that big 300mm. 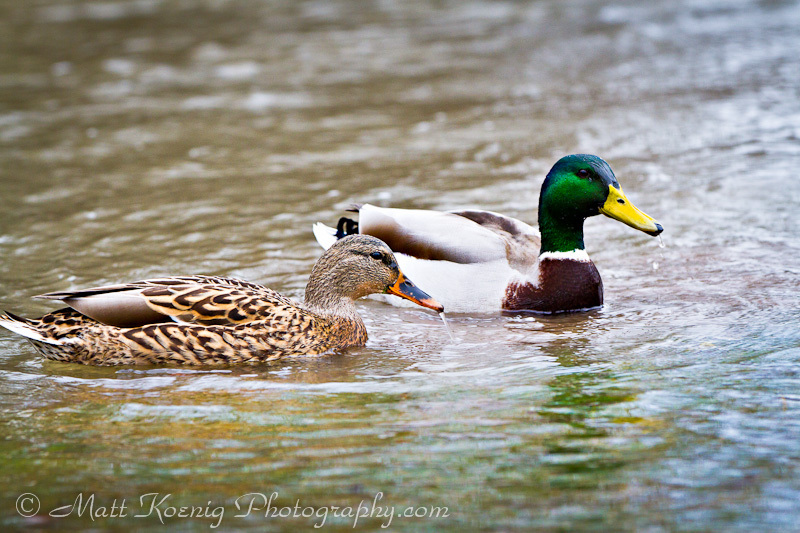 I was using my Canon 7D with the 70-200 f/2.8L IS II attached and took a few photos of ducks that were enjoying floating down the now submerged bike path. The regal head of the mighty mallard. I’m still getting used to the focusing on the Canon 7D. It’s quite different from my Canon 5D Mark II and I haven’t spent nearly enough time trying to figure it out and practice with it more. 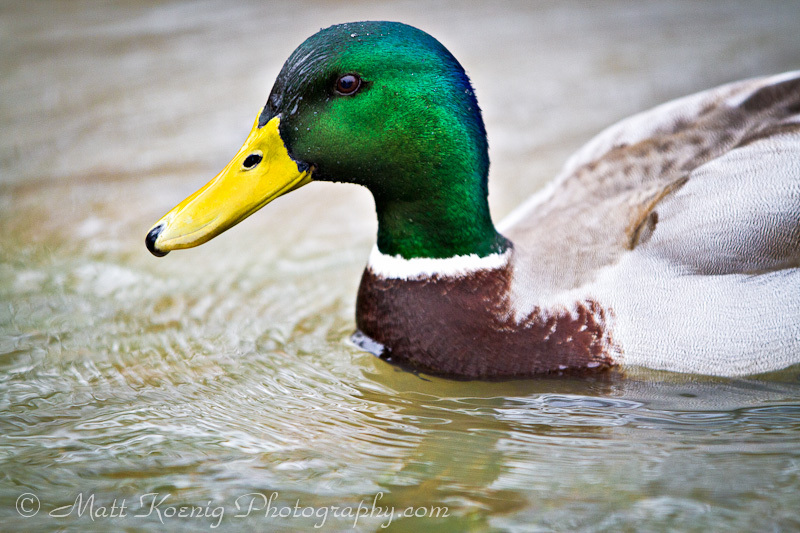 I’m not sure I nailed the focus with these duck photos due to my inexperience with the 7D. I will say that the 70-200 f/2.8L IS II is an incredible lens that is worth every penny of it’s high price. A pair of mallards happy with the flooding. 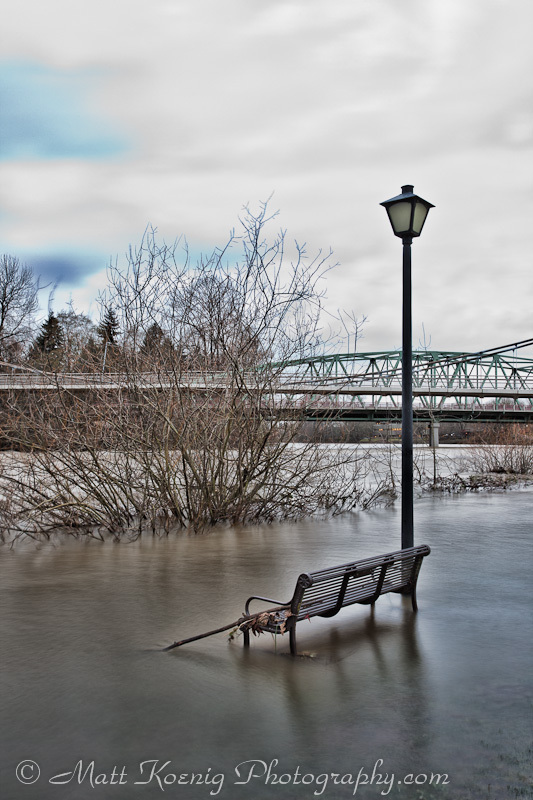 I had the Canon 5D Mark II with me as well and used it with the Canon 17-40 f/4L mounted on a tripod to take some landscape images of the flood waters. I really like this combination and typically go to it quite frequently. 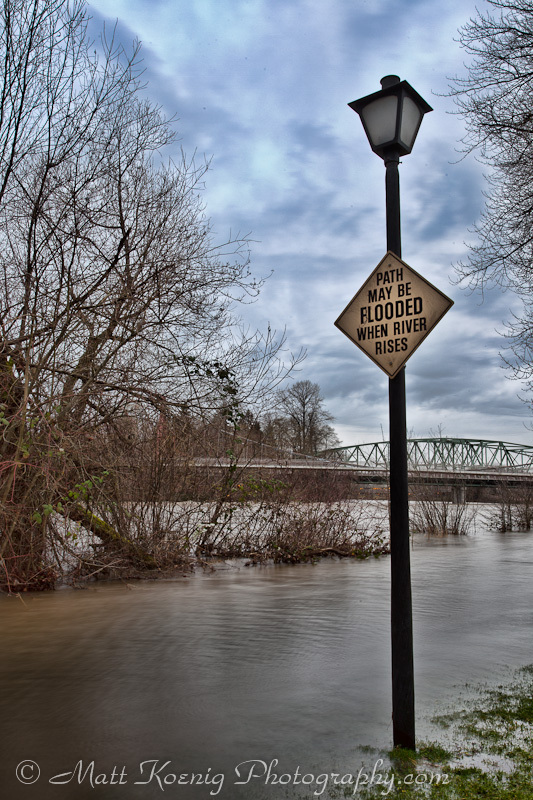 I saw this sign on the edge of the flood waters and got a kick out of it. I used a Topaz Labs Adjust 5 filter during post processing to give it a gritty HDR-like effect. I think it really brought the sky out better. This sign cracks me up a bit. Just down from the sign was a park bench now surrounded by water. I create one image in color and one in black & white. I definitely prefer the black & white version. Which do you prefer and why? These were both long exposure images so the water looks really smooth as a result. Water front park bench - wetsuit required. Also in black & white which is my favorite. I prefer this black & white version. What about you? The rain clouds were starting to move in again and we began to feel the first rain drops of the approaching storm. We hustled up the steps of the DeFazio bike bridge and despite the increasing rain had to stop and take a few shots from above the raging Willamette River. 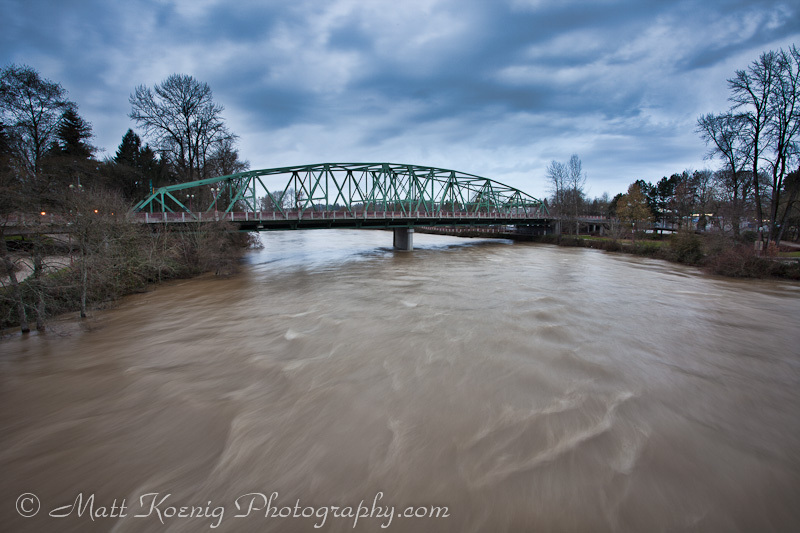 I decided to shoot facing west toward the approaching rain and with a great view of the Ferry Street bridge. I chose to do two different post treatments of this image; one with a slight HDR effect and the other with a bit of a boost in saturation. I’d be interested to see which you prefer. This one has a slight HDR effect applied during post with Topaz Labs Adjust Plugin. This image was taken with a longer shutter speed to really show the speed of the water racing below. I think it came out quite well. I applied a bit more saturation to this one. It's subtle. It was a great time watching the water and taking some photos. My boys enjoyed wading and throwing rocks and sticks in. As the drops of rain quickened we made it back to the parking lot and the car without getting too wet. I keep all my photo gear in a LowePro CompuTrekker backpack that has it’s own waterproof rain cover. It worked wonderfully. I hope you enjoyed the photos. Let me know which you liked best. If you enjoyed these photos consider sharing with your friends! Hey Matt, nice photo’s! My two favorites were the close up of the Mallard head and the partially submerged park bench (I preferred the color image over the b/w as color made it seem more life like and we have enough gray around here during the winter as is so the color helps cheer things up a bit). I did a 42 mile bike ride yesterday on the mountain bike (it has fenders), pedaling out to the end of Royal Avenue and then further on the gravel into the mud flats of the lake. There were a few Tundra swans, some least sandpipers and seemingly 1000’s of Dunlin’s. Rode back into town and followed the bike path from Skinner’s Park northward to Beltline on both sides of the river. Yeah it is definitely high and fast. The path was closed and gated off on the east side near Beltline but I rode around the gate and checked it out. There’s presently a lake (with Mallards) where the path normally winds through the woods there. Amazing! Finished the ride off with a jaunt up Skinner Butte and then made it home just before the rain started. Thanks! I wish we would have seen those tundra swans when we were out there at the end of Royal. Beautiful birds. Forty-two miles on a mountain bike is a good ride.